Here are a selection of testimonials that we have received from previous tenants of ours over the years, and from Bristol City Council. We have anonymised all testimonials for publication, and removed all private information. Unabridged originals have been kept on file. Thank you for finalising the deposit returns. Thank you once again for having us and I'm sure we'll be in contact in the near future when searching for a house for our final year. We have enjoyed our time whilst renting your property and would like to thank you for your quick responses and fixes to any issues we may have had! And your fair representation of how we left the house. thanks for confirming this, you've been a great help all year! Hi, we've just moved out [...]. Thankyou for letting us stay this year! Despite our emails, we thought you guys were awesome! We accept your deposit proposal and thank you again for being brilliant landlords, we thoroughly enjoyed our experience with you guys. My estate agents said they received your reference for my new accommodation and for this I am thankful. Indeed this year yourself and your members of staff have been nothing but accommodating, helpful and prompt when needed. If I do not get to see you, I just wanted to also say that it has been a pleasure to live here so thank you for taking us on. I hope this email receives you in good health and spirits. Thanks for this. I was just about to email you, but as usual you are on top of things. Let me take this opportunity to express my thanks to you for being such a reliable and responsive landlord. I've enjoyed living here. It's a nice place in a very good location. Wishing you nothing but the best in the future. SSP offer a fantastic service to their tenants. Their properties are well equipped and well maintained, and having worked closely with them this summer we've observed how they always go the extra mile to ensure that all their tenancies run as smoothly as possible. Ken and Alison are that rarest of finds - not only are they excellent landlords but they are thoroughly nice people who genuinely care about their tenants. They are My Fair Landlord's 'fair landlords'! Thank you for taking the time to meet with the property manager and provide us with such an in-depth response yet again so quickly, I appreciate it. We have very much appreciated the job done this year on your end by yourself, the Bennett's and anyone else involved. Any issues we had were swiftly dealt with and you have been easy and open to approach, which is more than I can say for a lot of landlords in Bristol. Thank you for having us this year. Firstly, I hope you are well! Finally, I would like to take this opportunity to personally thank you on behalf of the whole house on being fantastic Landlords! You have been one of the best landlords I have had personally, and we have already recommended your agency. Thanks for your time and I wish you well!!! I have now moved out. [...] Thank you for your efficiency, availability and kindness! 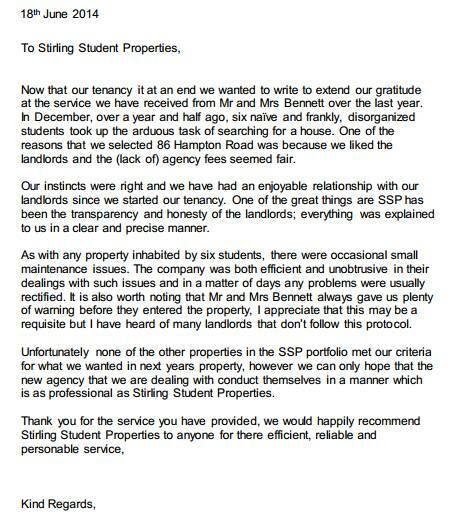 This letter is a brief, albeit honest account of our experiences of Stirling Property Management of Bristol. In the short time we have lived at this address we have mainly dealt with Mr. & Mrs. Bennett and their son and they are, above all, a family, and this shows in how they conduct their business. They have treated us with as much respect as we have treated them with, and I am glad to say that I am a tenant who can happily shake hands with his landlords and genuinely wish them well. They have been nothing but pleasant to us, flying in the face of the usual negative attitudes I expect to be paid towards students (attitudes my peers with other landlords have experienced). They have responded to our issues within a reasonable amount of time, fixed the issues, and they have never made us feel like we weren't being taken seriously. The Bennetts, and all of the team who work with/for them, are truly a credit to the world of landlords, and I can say that I do not think I would consider doing business with another landlord for as long as I possibly can. To conclude; Stirling Property Management (the Bennetts) are good at what they do and, more importantly, they do it with care and respect. This is why myself, and my fellow tenants, will be staying at this property for as long as the Bennetts will allow. Many thanks for 5 years of top quality landlording! 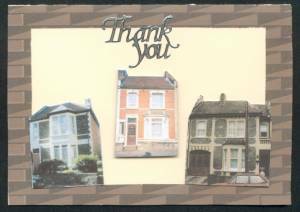 Now that our tenancy is at an end we wanted to write to extend our gratitude at the service we have received from Mr and Mrs Bennett over the last year. In December, over a year and half ago, six naïve and frankly, disorganized students took up the arduous task of searching for a house. One of the reasons that we selected [...] was because we liked the landlords and the (lack of) agency fees seemed fair. 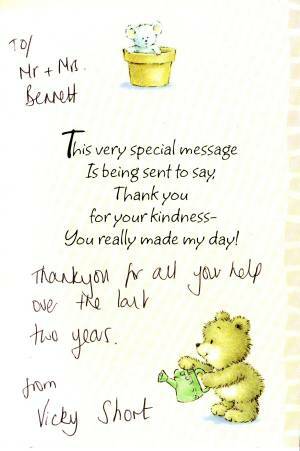 Our instincts were right and we have had an enjoyable relationship with our landlords since we started our tenancy. One of the great things are SSP has been the transparency and honesty of the landlords; everything was explained to us in a clear and precise manner. As with any property inhabited by six students, there were occasional small maintenance issues. The company was both efficient and unobtrusive in their dealings with such issues and in a matter of days any problems were usually rectified. 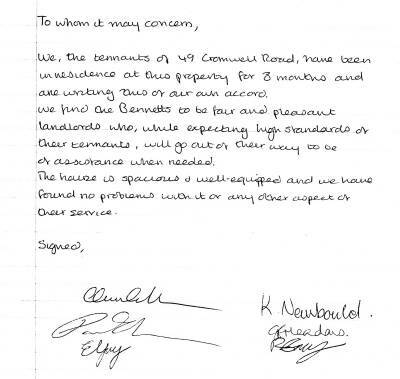 It is also worth noting that Mr and Mrs Bennett always gave us plenty of warning before they entered the property, I appreciate that this may be a requisite but I have heard of many landlords that don't follow this protocol. 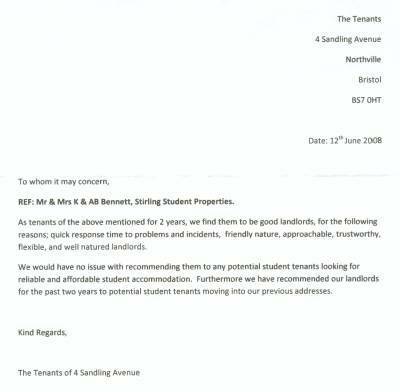 Unfortunately none of the other properties in the SSP portfolio met our criteria for what we wanted in next years property, however we can only hope that the new agency that we are dealing with conduct themselves in a manner which is as professional as Stirling Student Properties. My student accommodation with Stirling Student Properties has been successful throughout my tenancy. Transactions and payments have been negotiated and reliable. The landlords are very understanding when it came to late payments due to waiting for my student loan to come in and other financial problems. Any problems with the property were dealt with and fixed in an agreeable time period and at no cost to ourselves as tenants when they were not due to our own fault. Overall Stirling Student properties have been helpful and reliable, allowing good communication and support between tenant and landlord. Just want to thank you for all the hard work you did to get the house looking as good as it does. And from a more personal point of view what a relief to know that whilst I am away at work our interest are in such good hands and therefore my girlfriend is happier which makes my life easier :-) but on a serious note it really does give me peace of mind after the previous experience she has endured working with people who are not so honest, not so straightforward and definitely not so conscientious. I look forward to continue to work with you guys. H N, tenant from July 2011-June 2012. I lived there with five other girls and we are all studying at the University of the West of England. The house itself is a very big house with six bedrooms, a living room, kitchen, dining room, utility room and three shower/WCs. There is a small garden with a balcony too. We have really enjoyed living in this house. We had it made into a home for ourselves and felt very safe within it, as each door leading to outside had double bolts and the front door had two locks and a porch door with another lock. The furniture was all good considering it is a student house. Whilst we have been at North Road some furniture was broken but this wasn't down to our carelessness but down to wear and tear which is completely normal with any old furniture. When items did break the Bennetts were quick to come to the house and fix things for us. We highlighted items that were broken before we arrived at the house as we were worried we would be charged for them. I wrote an email to the landlords expressing our concerns about this. The landlords came round within days of the email being sent and sorted out any problems we had. The landlords have always given us notice via an email before visiting the house. The did a couple of house checks near the beginning of our stay there. They checked to see the house was being looked after and they checked that we were happy living there. I found the landlords to be fair and as we got to know them better they were very approachable. Mr and Mrs Bennett are the most down to earth, soft hearted people you will ever meet. With a passion for what they do, and a dedication to the students in their care, no problem is too small to get their attention. When i was looking for this years student house, i was somewhat of a nightmare tenant in the way that my group size kept changing. Mr and Mrs Bennett must have shown me around every property they manage. Throughout this, they remained, professional, helpful and patient. We met with so many different student housing companies, one of which sent a young man, in a flashy suit and a huge, brand new 4 by 4. My immediate thought was "well i know where my money is going now don't i?". You only have to meet the Bennetts, see the houses, and their response time (when/if you have a problem), to know where your hard earned money goes... Right back into your accommodation. When you meet Mr and Mrs Bennett you will be welcomed in a humble way, by two real people. I love that they are married, they have such a normal, married persona about them that warms any room. If you are looking for student accommodation, here is where you stop looking. I am beyond impressed. I have been passed on the case for 9 Oakley Road. I have read through your sound and thorough assessment... [non public information removed]. It is good to see such a diligent and professional approach to the management of your properties. I would like to thank you for a brilliant 2 years in the house. 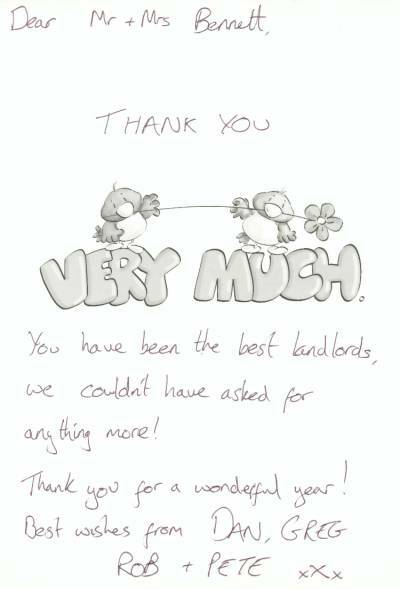 You have been the best landlords, we couldn't have asked for anything more! Thank you for a wonderful year!" As tenants of the above mentioned for 2 years, we find them to be good landlords, for the following reasons: quick response time to problems and incidents, friendly nature, approachable, trustworthy, flexible and well natured landlords. We would have no issue with recommending them to any potential student tenants looking for reliable and affordable student accommodation. Furthermore we have recommended our landlords for the past two years to potential student tenants moving into our previous addresses." Thank you for your services, I would recommend anybody in Bristol to hire accommodation with SSP. "I would like to take this opportunity to thank you for your assistance and constant attention to the needs of the house whilst we, the tenants, have been in residence for the past year. I have been very impressed and grateful for your speed of response in particular to installing broadband internet routing facilities at your own expense into each bedroom and the efforts you made to purchase and supply a brand new vacuum cleaner and microwave oven less than 24 hours after the old ones had broken down without any questions being asked; not to mention the new boiler fitted in the bathroom after the old one suddenly went into voluntary retirement! We have all appreciated your friendly and courteous manner and I hope that you can use this letter as a personal recommendation to new tenants." "James and I can't thank you enough for all you have done for us. You have made the daunting move away to uni so much more welcoming by providing us support, never being too busy for a chat and even negotiating a bargain for our car (with Mr B's natural gentle persuasion) - well beyond the call of duty but very much appreciated. We wish you the best of luck for the future of S.S.P. & all the happiness for the 2 of you." 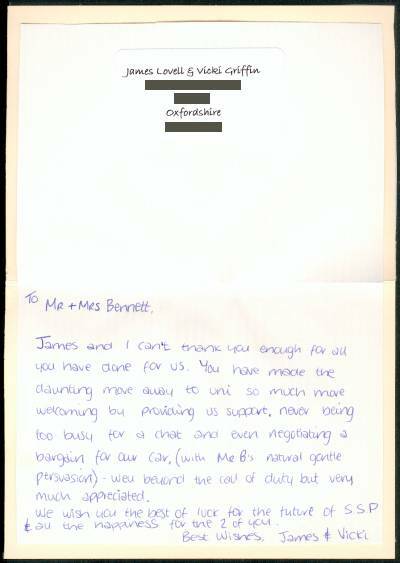 "I have been with the landlords Mr and Mrs Bennett for the whole four years of my university degree, and my partner for three years, after spending his first year in halls. I have wanted to stay with the Bennetts as I have been looked after very well. I believe that students could not wish for more reasonable landlords, given that for many it is the first experience of renting after having lived with parents. 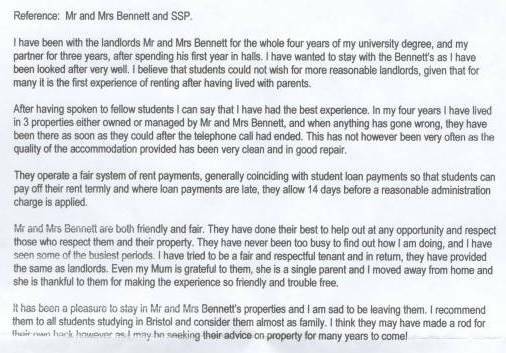 After having spoken to fellow students I can say that I have had the best experience, in my four years I have lived in 3 properties either owned or managed by Mr & Mrs Bennett, and when anything has gone wrong, they have been there as soon as they could after the telephone call had ended. This has not however been very often as the quality of the accommodation provided has been very clean and in good repair. They operate a fair system of rent payments, generally coinciding with student loan payments so that students can pay off their rent termly and where loan payments are late, they allow 14 days before a reasonable administration charge is applied. Mr and Mrs Bennett are both friendly and fair. They have done their best to help out at any opportunity and respect those who respect them and their property. They have never been too busy to find out how I am doing, and I have seen some of the busiest periods. 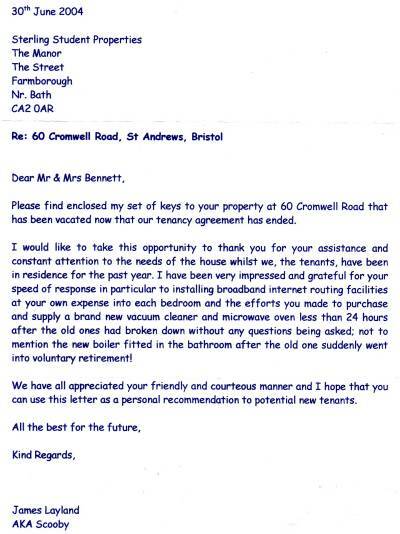 I have tried to be a fair and respectful tenant and in return, they have provided the same as landlords. Even my Mum is grateful to them, she is a single parent and I moved away from home and she is thankful to them for making the experience so friendly and trouble free. It has been a pleasure to stay in Mr and Mrs Bennett's properties and I am sad to be leaving them. I recommend them to all students studying in Bristol and consider them almost as family. I think they may have made a rod for their own backs however as I may be seeking their advice on property for many years to come!" "We, the tenants [...] have been in residence at this property for 8 months and are writing this of our own accord. We find the Bennetts to be fair and pleasant landlords who, while expecting high standards of their tenants, will go out of their way to be of assistance when needed. The house is spacious & well equipped and we have found no problems with it or any other aspect of their service." "Thank you very much for looking after me for one year. I could live nicely with my flat mates through your help. 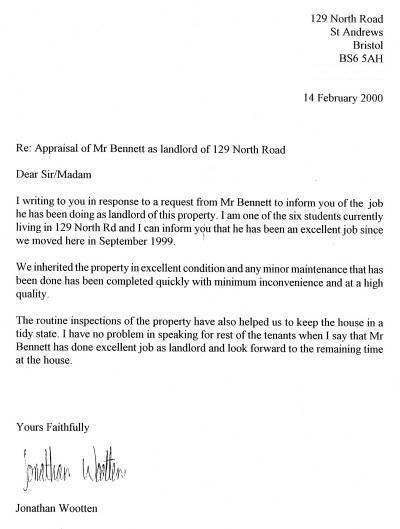 "I am writing to you in response to a request from Mr Bennett to inform you of the job he has been doing as landlord of this property. I am one of the six students currently living in [...] and I can inform you that he has been [doing] an excellent job since we moved here in September 1999. We inherited the property in excellent condition and any minor maintenance that has been done has been completed quickly with minimum inconvenience and at a high quality. The routine inspections of the property have also helped us to keep the house in a tidy state. 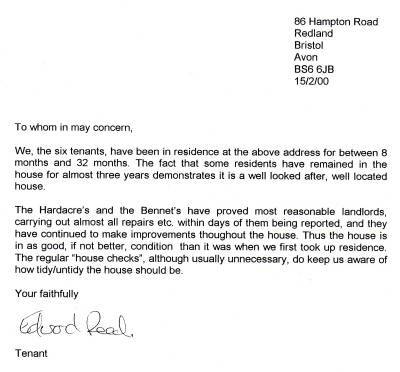 I have no problem in speaking for [the] rest of the tenants when I say that Mr Bennett has done an excellent job as landlord and look forward to the remaining time at the house." "We, the six tenants, have been in residence [...] between 8 and 32 months. The fact that some residents have remained in the house for almost three years demonstrates it is a well looked after, well located house. The Hardacres and the Bennetts have proved most reasonable landlords, carrying out almost all repairs etc. within days of them being reported, and they have continued to make improvements throughout the house. Thus the house is in as good, if not better, condition than it was when we first took up residence. The regular "house checks", although usually unnecessary, do keep us aware of how tidy/untidy the house should be." "Thank you for your help over the last two years"